The Webcomix Thing was brilliant – the day started with me working out a revolutionary new way to staple involving a spoon (no, really) and only went up from there, mostly thanks to all the wonderful people who came and still seemed to remember who I was. Thank you people with good memories! I even managed to sell out my hastily constructed minicomic ‘Beaver and Steve volume 2 1/2 : the Owl of Regret’ – sorry to anyone who missed out on the badly printed action! I also got to meet so many talented artists that it would be impossible to list them all here – suffice it to say that I wish the Thing could happen every week, even though it would probably kill me. Bad News: The Comic section is not going to appear in the Guardian any more which means that my strip is not going to reach it’s conclusion. Combine this with the death of the DFC and it’s becoming a bit of a comics apocalypse. 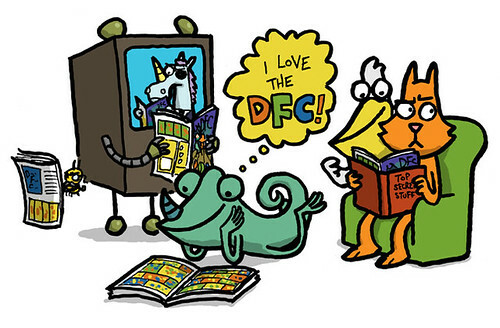 I’m still waiting to hear from Random House what they want to do with Super Animal Advneture Squad now that the DFC is finished (they own the rights to the concept), but hopefully this will not be the end of their adventures … we will just have to wait and see! 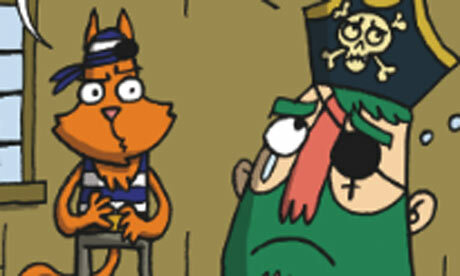 This entry was posted in Comics and tagged comics, super animal adventure squad, the dfc, the guardian, uk webcomix thing on March 30, 2009 by eruditebaboon. The Thing and another thing. Just a reminder: I will be at the UK Webcomix Thing in London this Saturday – I am going to try to have a mini comic available to sell on the day, but so far I’ve only managed to create one page (see my previous entry), so it may be very mini. I’ll also have books and badges, and even if you don’t want to buy anything it would be lovely if you wanted to come by and say hello! Here’s an image I’ve been meaning to post for a while – it’s my cover for issue 40 of the DFC that ran a few weeks ago (the final issue is this week – sob!). I hope you like it! This entry was posted in News and tagged the dfc, the thing on March 23, 2009 by eruditebaboon. A couple of hours ago I passed out at my computer, and when I came to this strange comic was on my screen. Where did it come from? Who is that strange lizard/dinosaur character? And why can I taste tin foil? P.S looks like the Guardian has failed to post my comic online AGAIN this week. I am sending in a polar bear to devour the newspaper pixies responsible. This entry was posted in Comics, News and tagged cobras, comic, mystery, vampire on March 19, 2009 by eruditebaboon. Super Animal Adventure Squad, episode three! Well, it looks like the Guardian has completely forgotten about episode two, and right now I’m not really sure who has the rights to everything so I don’t know if I can post it myself, but for the mean time here is episode three! 1) using their superior detection skills the squad figured out that the Baboon was stolen by the Dread Pirate Green Beard, and have gone to Pirate’s Cove to track him down.2) Episode two was really funny. Seriously, you really missed out. 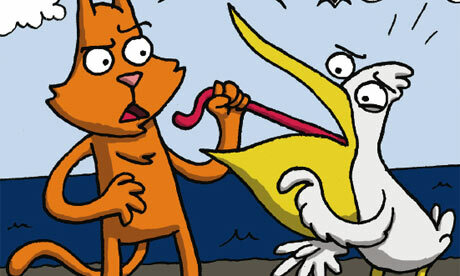 This entry was posted in Comics, News and tagged comics, super animal adventure squad, the guardian on March 9, 2009 by eruditebaboon. 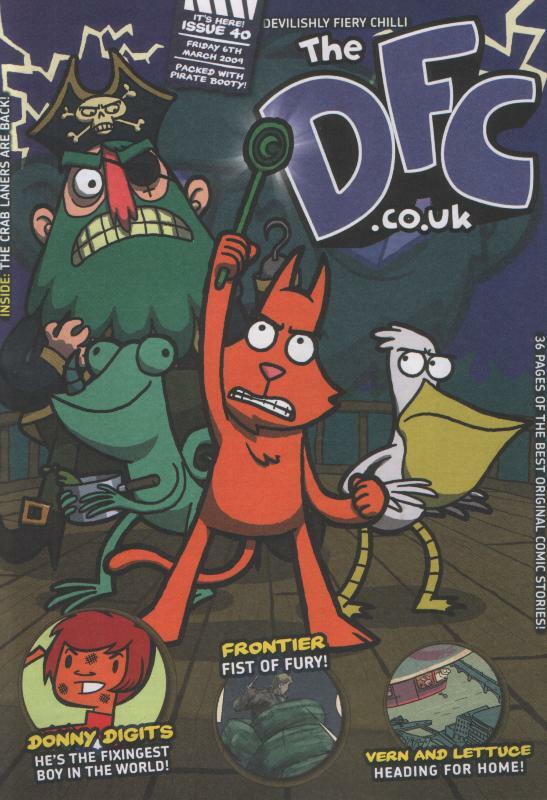 The DFC, a weekly comic (launched May 2008) for boys and girls is up for sale, following a decision by The Random House Group to cease publication. Philippa Dickinson, MD RHCB, said: “We are very proud of the DFC and the reaction it received from families, schools and especially the children who have enjoyed reading it. It is an innovative concept which we have been very happy to back. There can be no successes without taking risks, after all. Unfortunately, in the current economic climate, we have decided that the DFC is not commercially viable within our organisation. If no buyer is found, the title will close on March 27th. It’s a real shame that it’s ended so soon, but it’s been an absolutely fantastic experience and I’m really proud of what everyone at the DFC has acheived. Go us! Now, does anyone have a few quid kicking about and want to buy themselves a comic…? P.S for those of you wondering where this week’s edition of Super Animal Advneture Squad is, I’m afraid it looks like the Guardian hasn’t bothered to put the comic section in their online edition this time. The scoundrels! If it turns up I’ll let you know – and hopefully they’ll remember to do it next week! This entry was posted in News and tagged colon open parenthesis, super animal adventure squad, the dfc on March 3, 2009 by eruditebaboon.